During IFA 2012 in Berlin, Huawei announced their latest Android ICS sporting smartphone in the form of the Huawei Ascend G600, a handset that sits just below the Huawei Ascend P1, and we have a little hands on video with the Huawei Ascend G600 that was taken at the Berlin event for our readers viewing consideration below. The Huawei Ascend G600 hands on video comes our way courtesy of the guys over at Engadget, who of course where on had to get a short playtime with the Android Ice Cream Sandwich smartphone that offers a 4.5-inch qHD touch screen along with a 1.2GHz dual core processor. The Huawei Ascend G600 also offers an 8 megapixel rear facing auto-focus camera, 738MB RAM, 4GB internal storage, two built-in speakers with DTS audio enhancing tech, NFC functionality, micorSD expansion up to 32GB, a 2000mAh battery, and runs Android 4.0.4 of course, and measures 134 x 67.5 x 10.5mm. 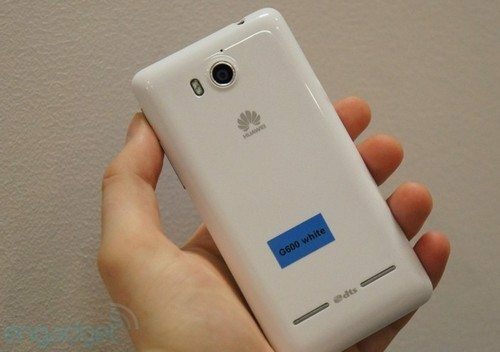 Apparently the Huawei Ascend G600 will become available in December in Germany in two colours, Mysterious Black, and Pure White, and is said to command a price tag of â‚¬300, which is roughly $375, no word on if or when the Android smartphone will hit other markets though. Anyway that’s your lot with the Huawei Ascend G600, all you need do now is head on down to mash that play button to check out the hands on footage, and of course feel free to let us know if the Ascend G600 is an Android smartphone that floats your boat by dropping us a line to our comments area below…enjoy. I’m loving the look and specs on this, looking to upgrade my htchd2 soon. One qeuestion, what is the case made from? I hope its a solid finish.